Forever Together can lose her maiden tag in the best way by winning the Investec Oaks at Epsom. She looked a filly very much on the improve when staying on in taking fashion for second place behind her Aidan O’Brien stablemate Magic Wand in the Cheshire Oaks. As for the places, Godolphin’s Wild Illusion looks the main danger; fourth in the 1000 Guineas, she will relish the step up to a mile and a half. 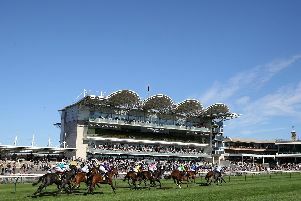 William Haggas’ Give And Take won the Musidora at York and that gives her each-way claims. Cracksman was the best horse to come out of last year’s Derby and he can prove the point further in the Investec Coronation Cup. John Gosden can also strike with Kings Shield, who drops back in grade and distance in the Investec Surrey Stakes. Richard Fahey’s Lady In Question can get back on course in the British EBF Supporting Racing To School Fillies’ Handicap at Catterick. Ganayem looks a good bet in the Rudimental Confined Fillies’ Novice Stakes at Goodwood on the strength of her victory on her seasonal debut at Nottingham. The runner-up, Worth Waiting, gave the form a timely boost by registering a smooth success at Redcar on Tuesday. Bath: 5.45 Toolatetodelegate, 6.20 High Horse, 6.50 Zarrar, 7.25 Wind In My Sails, 7.55 Met By Moonlight, 8.30 On A Roll, 9.00 Prominna. Catterick: 1.50 Akela Moon, 2.25 Royal Flag, 3.00 Donny Belle, 3.35 Elgin, 4.10 Lady In Question, 4.55 Lucky Beggar, 5.30 Mitchum, 6.05 Glyder. Market Rasen: 1.40 Settie Hill, 2.15 League Of His Own, 2.50 Visage Blanc, 3.25 Red Tornado, 4.00 Burst Ya Bubble, 4.45 That’s The Deal, 5.20 Mick Thonic. Tramore: 5.40 Two In One, 6.15 Bold Sky, 6.45 Count Simon, 7.20 Maple Lawn, 7.50 Swift, 8.25 Schmidt, 8.55 Shetland Bus. Doncaster: 6.00 Lucky Louie, 6.30 The Navigator, 7.00 Los Camachos, 7.35 Almoreb, 8.05 Come On Come On, 8.40 Show Of Force, 9.10 Dr Richard Kimble. Epsom: 2.00 Cosmic Law, 2.35 King’s Pavilion, 3.10 Cracksman, 3.45 Ajman King, 4.30 FOREVER TOGETHER (NAP), 5.15 Kings Shield, 5.50 Juanito Chico.